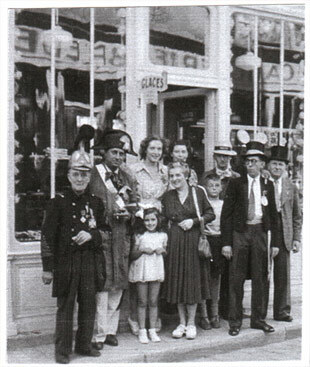 A few members of the Free Downtown Committee in front of the confectionery store on 18, Grande Rue : the eldest would recognize Mr Pinon (round glasses) as the Mayor, his deputy Marcelle Epinette standing on his right hand side. Behind her : Françoise Lamy and her mother Andrée ; on the left hand side : a fireman and a policeman. Miracle at Mont Martel* water spring during the Downtown Festival. 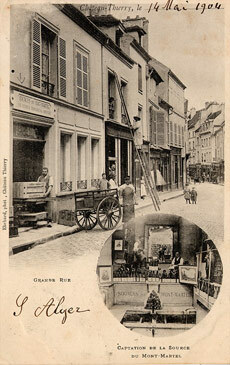 * a water spring discovered in 1629 by Martine de Bertereau, wife of the Baron de Beausoleil. From 1632 on, she decides to write several books, including Pluto’s Restitution in 1640. She describes her methods, her mining discoveries and her discontent. The book is meant for the powerful Cardinal de Richelieu. As an answer, Richelieu has the Beausoleil arrested. Jean du Châtelet is snetenced to prison in the Bastille and his wife is jailed at the Vincennes Castle. They died around 1645 and 1642 respectively.